One can argue that shoe selection will make or break an outfit. Something may look fabulous, but if you can’t walk the walk in your shoes due to pinching, pain, and blisters, they’re not going to cut it. Similarly, another option may be cozy central, but style-wise they cause what could have been a stellar ensemble to fall flat. For example, Amanda’s go-to morning school drop off look of sweatshirt, leggings, and low bean boots is super practical but won’t be winning her compliments any time soon! However, swap the sweatshirt for a classic spring jacket and slip on the Tom’s leather slides she’s been eyeing and voila! an outfit she can wear on all her errands without feeling frumpy. 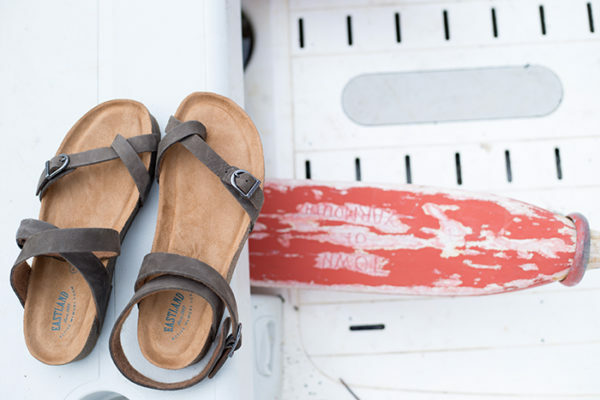 We have been on the hunt for an excellent go to sandal that is comfortable enough to allow you to walk around on all of your summer adventures, while also being stylish enough to complete an outfit and help your whole look shine. 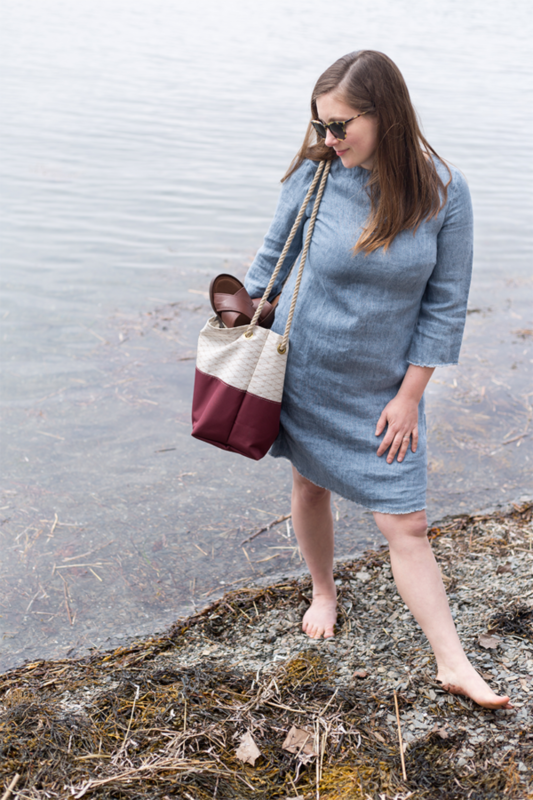 It’s no secret that we love local companies and favor Maine-based design, so one of our first stops was Eastland Shoes in Freeport, Maine. 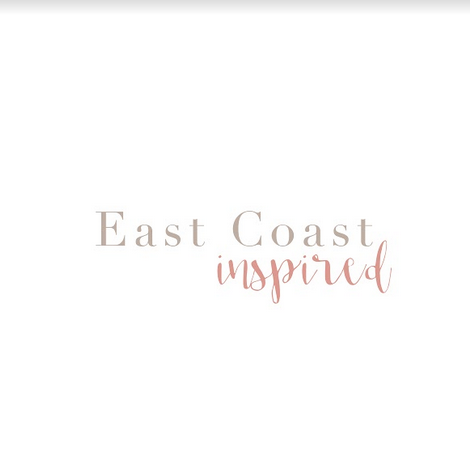 Known for its Americana heritage-inspired style that reflects their Maine roots, the Eastland Brands have been led by the Maine-based Eastland family for three generations. 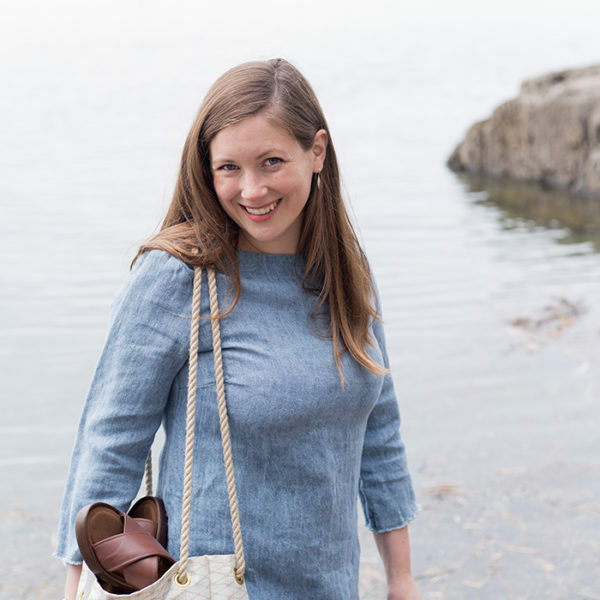 Their footwear collections offer shoes for consumers who appreciate classic New England style, long-lasting quality and great value in their casual footwear. They market full-grain leathers, handcrafted detail, durable soles and exceptional comfort. We chose to try two options that we thought would be the most stylish and versatile. First up was the Candice Crisscross wedge sandal. What drew me to this pair was the lift offered through the wedge, and the simplicity of the wide band criss cross. My first inclination is to always go for heels, but they are never practical for playing with children, walking around town doing errands, or exploring a new destination. These offer the fancy flair I crave from a heel coupled with a comfortable sole and manageable height I can wear all day. The cushioned sole was a truly delightful detail. With the smooth leather straps and wedge sole, this classic style can be dressed up or down easily. They would be great paired with tailored ankle length pants for work, chino shorts and a blouse for an elevated weekend look, or your favorite shift dress. These only come in whole sizes, so as per usual I opted for the 7 rather than the 6. I found the length to be too long, but the width nearly too narrow at first. With a little wear, the width became more comfortable and no longer pinched. While a size 6 would have been the better option for me in length, I do have a wide foot so the 7 ended up being the best choice for me. 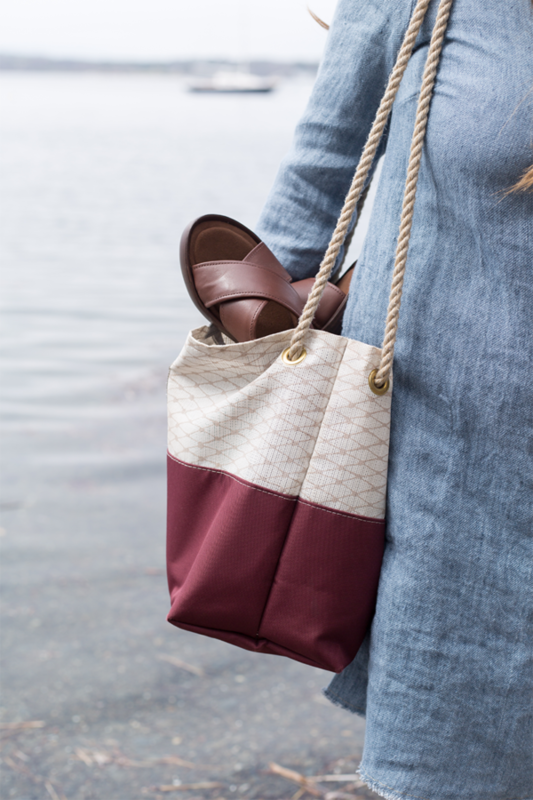 For our second look, we opted for the Squam Ankle Strap Sandal with thoughts of casual summer barbeques and visits to coastal towns floating through our minds. 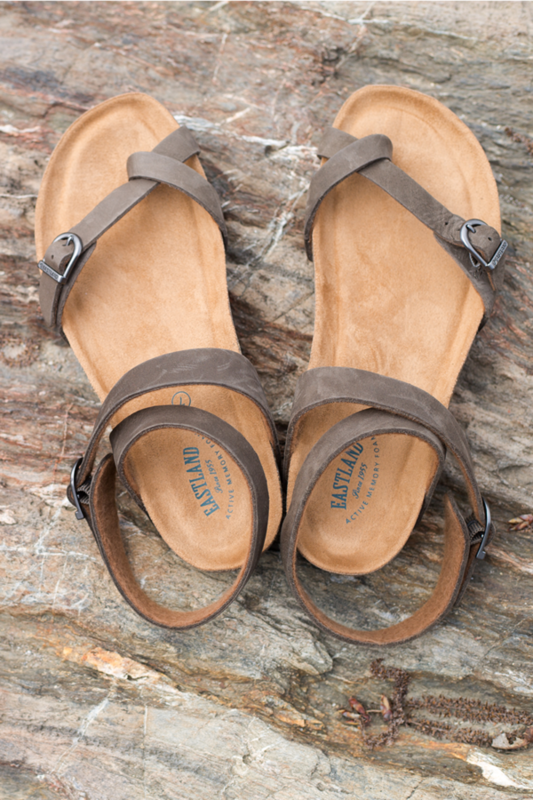 The footbed of this sandal is reminiscent of a Birkenstock, but with the lovely surprise of a memory foam cushion. The minimal strap design has a really secure feel because of the buckle around the ankle, and the inside of the leather is thoughtfully lined with soft felt; meaning this style will be ready for long walks with no chaffing right out of the box. These will pair nicely with your favorite cropped pants, wide or skinny, just be sure to allow space between the ankle strap and the bottom of the pant for the most flattering look. They’ll also be fun with casual dresses (Amanda has her favorite chambray sundress in mind) and denim shorts. With the cork footbed and nubuck leather, these definitely have a slightly more bohemian vibe compared to the classic feel of the Candice wedge. We find their most appealing attribute the adjustable straps: not only is the ankle strap very adjustable, as it crisscrosses before it wraps and buckles, but the strap at the toes can be adjusted as well, allowing for wide feet or high arches. 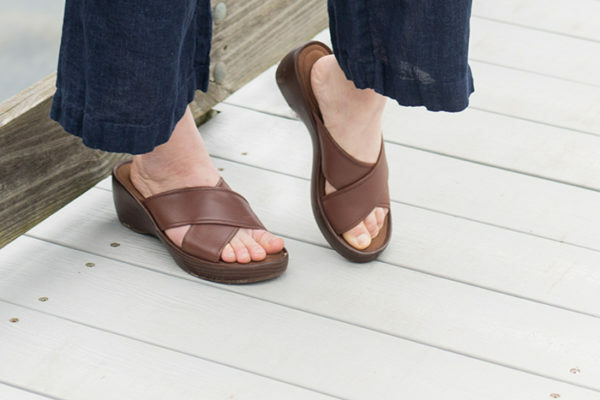 This footbed will also withstand both a day at work on your feet or a day spent exploring walking trails or any of the upcoming summer festivals: what’s not to love about a shoe that offers all-day comfort and an on-trend ankle strap? Regarding size, we found this style to run much larger than the first. While the site recommends half sizes to order up, the size 7 was much too large for me and also too large for Amanda, who usually takes a 7 shoe. It felt a lot more like a size 8 than a size 7. We definitely recommend ordering down a size. All in all, we found Eastland Shoes to provide a comfortable and durable sandal choice that will allow you to virtually float through summer in casual style.